The Trace Italienne set down and took firm root in the Low Countries, what is today Belgium and the Netherlands. Despite its impermanence, the Dutch made wide use of the earthen fort because they wanted a lot of forts in a little amount of time. The seams of the body politic there began to pop apart in 1565. Rebellion broke open the following year - on the surface against the heavy-handed Spanish governance, and more deeply against a monarch who was distant in more ways than by miles – and against a church many considered too-worldly, rigidly supported by that monarch. When the Duke of Alva arrived in 1567 and executed his draconian policies (along with many Dutch), bitterness turned into fire. After their opening ventures at rebellion flopped, the Dutch considered their options, disadvantages and advantages. They, like many other Europeans, respected the massed power of the Tercios of the Spanish armies. 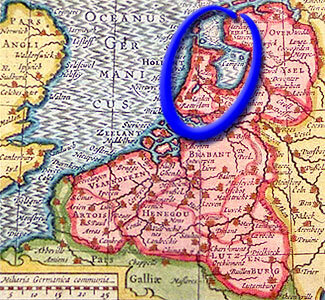 To the advantage of the Dutch, much of their land at the heart of the revolt – provinces of Holland, Zeeland and some neighbors - was wet to the point of going underwater if not diked and pumped out. Rivers, streams and canals cut up the countryside with marshes dotted around. These conditions naturally limited movement for any army (even mechanized ones in the Second World War). If movements of an enemy are thus limited, then setting up fortifications to hold lines of communication and supply will further place the enemy at a disadvantage. Of course, where there are avenues of supply and communication, there are towns and cities, which can be fortified. In 1572, the rebellion swelled and the Dutch began building fortifications, based on the new design from Italy. The style evolved by the Dutch came to be known as the "Old Netherlands System of Fortifications." It relied primarily on earthen ramparts, moats and simple bastions (less expensive than masonry, still robustly effective but needful of maintenance). The bastions were usually set so that the flank of one was within 250 yards / 220 meters of its mate, which is the outer range for a musket. By war’s end in 1648, nearly all large towns and cities had the new fortifications. 1616 map of the Lowlands, showing core area of Dutch revolt. Note the ready access to the sea, which provided the resistance with the highway to trade, communication, supply and foreign recruitment. “Expunge one towne after another, the least of a number whereof cannot cost him less than half a yeres siege with an infinite charge, loss of men and hazard of his fortune and reputation bycause (as men of war are wont to say) one good towne well defended sufficeth to ruyn a mightie armie.” Observed by William Davison the day prior to the Army of Flanders trouncing the Dutch at Gembloux in 1578. Although written in 1670 by the French military engineer, Vauban, this was the situation the Army of Flanders had to brave: “But since the number of strongholds has increased to the point where one can no longer enter enemy territory without encountering many fortified towns, its importance has increased to the point where one can say that today it alone offers the means of conquest and conservation. To be sure, winning a battle leaves the victor in control of the countryside for the time being, but only taking the fortresses will give him the entire country.” An army in the field could not simply bypass a fortress in its campaign. Any fortress remained a nest for resistors, a point from which raiders could pop out and rip into an army’s rear or routes of supply. So, a campaign had to include taking fortresses, one, then another, then another. Campaigners had to set aside the hope for grand and decisive battles in the field for dreary, lengthy battering at earthworks and walls. For their revolt to succeed, the Dutch did not have to win the war, they just could not lose it. In order not to lose the war, the Dutch placed themselves on the defensive and thereby came to rely on their stationary refuges dotted around their country: artillery forts. With an eye to the number wanted plus ease and speed of construction, the Dutch made many of their artillery forts of earth. By tying down and draining Spanish forces, and ultimately exhausting their resources, the Dutch did not lose the war.